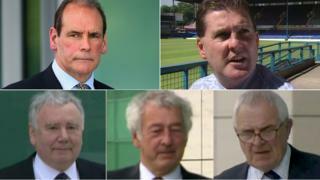 Three separate trials are planned for the prosecution of the six men facing charges over the Hillsborough disaster, the Crown Prosecution Service says. Former Ch Supt David Duckenfield will face 95 charges of manslaughter and five other senior figures are to be prosecuted over the 1989 disaster. Mr Duckenfield was match commander at the FA Cup semi-final when 96 Liverpool fans were fatally injured in a crush. It has not yet been decided where the trials will take place, the Crown said. The defendants, excepting Mr Duckenfield, will appear at Warrington Magistrates’ Court on 9 August. He was prosecuted privately in 1999 and the CPS is applying to the High Court to lift a court order imposed, which must be removed before Mr Duckenfield can be charged. The judge will be updated on the progress of this application by 6 September and if successful, the case will proceed directly to crown court. On the same day, the next hearing for the other five is due to be held at Preston Crown Court. If each of the men plead not guilty, the CPS said it anticipated three separate trials being held. One would comprise Mr Duckenfield and Graham Mackrell, who was the company secretary at Sheffield Wednesday at the time of the disaster. A separate trial would be held for ex-South Yorkshire Police (SYP) Ch Insp Sir Norman Bettison. Another trial would include Peter Metcalf, who was a solicitor for SYP, and two SYP officers – former Ch Supt Donald Denton and former Det Ch Insp Alan Foster. Last year, new inquests into the disaster at the Liverpool v Nottingham Forest match, held at Sheffield Wednesday’s ground, concluded the fans had been unlawfully killed. The inquests found that Liverpool supporters were not responsible for the dangerous situation at the Leppings Lane turnstiles. The CPS brought charges following referrals from the Operation Resolve investigation into the causes of the disaster and the Independent Police Complaints Commission (IPCC) probe.